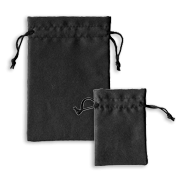 Shop our collection of micro-fiber drawstring pouches and help your customers present their gifts in an elegant way! These premium-looking pieces are perfect for packaging jewelry items such as rings, earrings, pendants, necklaces and more. Thanks to our wholesale deals & discount prices you won't break the bank!